It began with me paddling out with Helina. She was going to help me catch a wave in. And while we weren’t having any trouble getting through the whitewash, there was one problem… Something was following us (insert Jaws music here). Good thing for us, it was only our El Coco Loco beach companion, Rocco. And while it was no scene from Shark Night 3D, he would not leave the back of my board. Rocco frantically swam to stay with us as we paddled into the waves. Helina and I joked about him wanting to catch a ride himself. That’s when we looked at each other and concocted a plan. He willingly let Helina pick him up and position him while I held the board steady. He was all set to catch a wave in. It was genius. We just didn’t think it through. In the midst of all the excitement, Helina and I forgot that I was leashed to the board. So as she attempted to push him into a wave the cord pulled at my ankle, immediately ending Rocco’s ride. You could tell he was bummed as he swam back to the beach. Helina and Lindsay would try again later, this time choosing a board that did not have a person attached to it. And lucky for you, Holly was at her camera, ready to capture this Disney moment in the making. (Video courtesy of Holly Beck). Impressed? So were we. 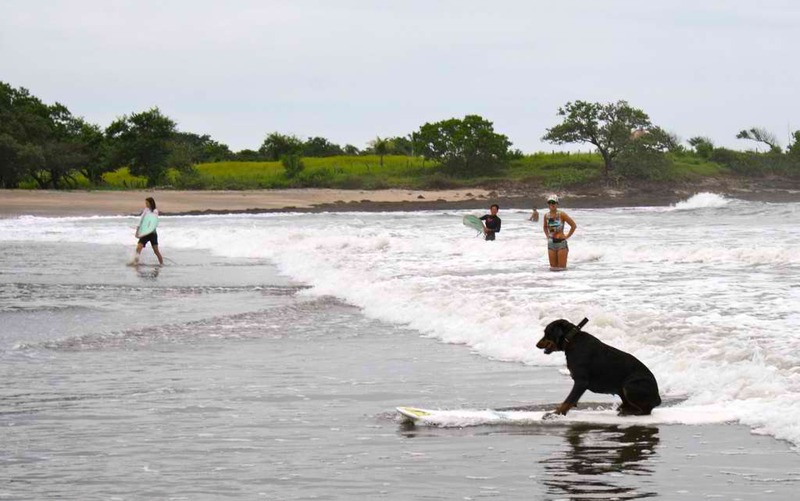 A Rottweiler was schooling us on the waves, showing us up with his natural ability and style. But mostly it was adorable. This entry was posted in Nicaragua and tagged El Coco Loco, Holly Beck, Nicaragua, rottweilers, Shark Night 3D, Suave Dulce, surf retreats, surfing, surfing dogs by Hilary Billings. Bookmark the permalink. Oh this is soooooo AWESOME, I love it. Makes me want to visit just to give him a victory hug!